Bhubaneswar, June 8: When Sambalpuri folk singer Padmini Dora came on stage at the Rangabati festival organised by the Odisha tourism department recently, the emotional intensity of her voice left the audience asking for more. From veteran musicians to listeners at the programme, everyone appreciated Padmini’s performance. For the singer, who has been performing for over 20 years now, every time she gets such a response for her rendition, it makes her “dreams” come true. Born and brought up in Sambalpur, Padmini neither came from a family with a background in music nor had she ever imagined that she would be a professional singer one day. “I loved music as a school girl. But I never got a chance to be trained. So, I never thought that I could make a career in singing. But when I was in Class VIII, some eminent singers of our region once heard my voice at a school performance and encouraged me to sing,” said Padmini. By just listening to shows on classical music on the radio, a 15-year-old Padmini trained her vocal chords. Later, she gathered the courage to appear for an audition at the All India Radio in 1991 as a Class X student and got through. “My parents consistently helped me to pursue my dreams and, miraculously, I happened to meet well-known singer Bijay Behera when I was looking for some guidance. He was my first guru and trained me the basics,” she said. Padmini soon established her name by singing pure folk songs for musicians such as Abhijit Mazumdar for albums such as Chanhara and Luk Lukani. Her works with composer Ratan Pujari are popular even today. One of her well-known albums is Manchuni that is based on traditional Radha Krishna rasa in the Danda folk style of Balangir and Sonepur. The singer who is well versed in nachniya, bajniya, dalkhai, raserkali and danda folk varieties of singing, however, laments that folk music is in a bad state. “The advent of video albums should have brought about a positive change for folk music, but over the years it only brought vulgarity. But our efforts are on to keep the authentic traditional music and songs alive. We are sure folk songs will be conserved,” said Padmini, who is a part of the Lahiri dance troupe that performs the authentic music and dance of western Odisha. 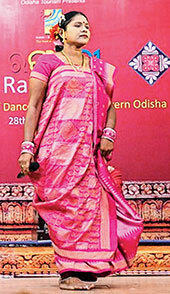 Although busy performing throughout the country for various cultural programmes, Padmini loves being in Bhubaneswar. “I have always received rave response for the authentic folk music and I will be back here to perform during Raja,” she said. At a time when the demand for a separate state for western Odisha is gaining momentum on grounds of negligence of the western Odisha region by the State government, an IAS officer’s small step has taken a giant leap forward in erasing the much-hyped western-coastal Odisha divide. The just concluded three-day Rangabati Utsav, a festival of dance and music of western Odisha – a brain-child of Ashok Kumar Tripathy, the Principal Secretary of Tourism and Culture of Government of Odisha – staged in the capital by Odisha Sangeet Natak Akademi with financial support of Odisha Tourism and the first of its kind for the State, reaped rich dividends by reposing their faith in the people of western Odisha. “Earlier, when we performed in Bhubaneswar, we were not being treated properly. But, the grand platform, treatment and hospitality that we received during this government-organised festival were amazing. It was a belated but befitting step that the government initiated to showcase the unique cultural tradition of western Odisha. We were honoured that the Governor, the ministers and many eminent people came to watch us,” remarked Ghasiram Mishra, master percussionist and septuagenarian artiste from Bolangir, whose captivating concert fetched him standing ovation. Legendary singer Jitendriya Haripal, better known to the world as the male singer of the evergreen Rangabati number, was full of praise for the organisers of the event. “It was for the personal effort of the officer (Principal Secretary) that I and Krishna Patel could sing together on stage for the first time after a gap of 30 years, he said. Bhubaneswar, March 18 (IANS) Indian Ppremier League cheer leaders will face some competition , in wooing crowds, during the T-20 matches in Cuttack as the Orissa Cricket Association (OCA) has decided to organise a performance by traditional Sambalpuri dancers before the start of every match. “We have requested the IPL authorities that we would like to include Sambalpuri dance during the IPL matches, which has been accepted by them. We have included Sambalpuri dance to showcase Orissa’s culture during the IPL matches,” OCA secretary Ashirbad Behera told IANS. “About 70 Sambalpuri dancers will perform for an hour before the start of the match,” he said. But they will not be a replacement for the popular cheer leaders. “Cheer leaders are a part and parcel of IPL matches and they will be in action during the matches here. We have set up seven platforms for their performance,” he said. Kalinga Sena, a fringe political outfit in the state, had threatened to disrupt the IPL matches if cheer leaders perform during the matches. Cuttack, a non-IPL franchisee city, got a chance to host matches after the Hyderabad-based Deccan Chargers picked Barabati Stadium here as a venue, terming it as their “catchment” area. The Deccan Chargers will meet Kings XI Punjab March 19 and Delhi Daredevils March 21.